Inspired by a recent sighting of 'Bess beetles' (family Passalidae), I decided to learn more about them. As a first step, could I identify our local species, beyond the family level? It has turned out to be a very productive exercise! It is not uncommon for us to find these large, shiny beetles and their larvae. They live inside or beneath decomposing wood. We leave most rotting logs undisturbed on the forest floor, well aware of their importance as habitat. But we do also have a wood pile, set aside for our house heating. Turns out that some of that wood is starting to rot down quite nicely too! The beetle family Passalidae is quite distinctive. live a social life. That is, they live in extended family groups. The adult beetles tend the defenceless larvae, preparing food and providing tunnels in which the larvae are kept safe. spend almost their entire lives hidden away ... even the adults, and they are quite long-lived. Young adults may make a brief nuptial flight, but once established in a suitable log, an adult may remain in the same gallery for years. communicate using sound. Both adults and larvae produce sounds, and are reported to have the widest repertoire of any insect. And they're quite audible to human hearing! 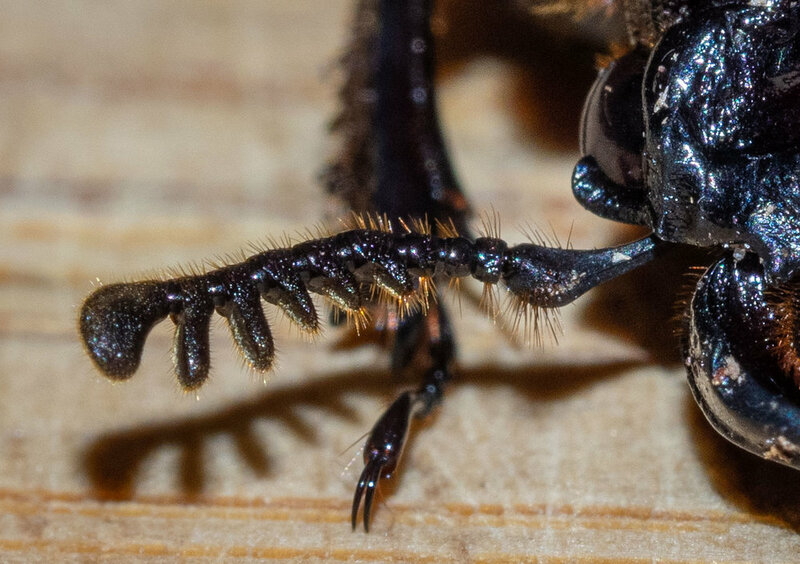 And it turns out that Bess Beetles are quite well known - as pets! They are sold in various countries, including Australia, marketed as intriguing and easy-care insects for children and school classrooms. Despite this notoriety, knowledge of their biodiversity and ecology is limited. I guess this is not so surprising, given their cryptic lifestyle. We came across a group of Passalid Beetles this month, living beneath a rotting log. And we assumed they were the same species we've seen before. They weren't! I took a closer look at two of our earlier records, and each turned out to be a unique species. Even for me, this degree of biodiversity came as a surprise. To give this some context, there are not that many Passalid species known locally. There are about 500 species worldwide, but just 35 in Australia. When it comes to beetles, that makes this quite a small group. In this one patch of forest we have recorded: Pharochilus punctiger (Species 1), Aulacocyclus edentulus (Species 2), and Pharochilus rugiceps (Species 3). So we have nearly 10% of the nation's Passalid biodiversity right here! And we haven't been actively surveying ... just occasionally lifting a log ... so there could be even more! Now, I'm going to present a detailed explanation for each of my identifications of Species 1-3. If insect taxonomy is not really your thing, this probably won't make compelling reading. You're excused, no offence taken. But if you're an entomologist – or even just a little bit curious – please do read on. Needless to say, I find it fascinating. After spending a week getting my head around the subject of Passalid identification, it makes sense to document my logic. I'll forget otherwise! And, if I'm wrong, it will help an expert identify my error. Key reference ... with keys! A paper from the 1930s remains the key reference for Australian Passalids. There have been a few species discovered or rediscovered in recent years, mostly in Queensland. However, in each case the researchers relied heavily on the same, seminal work by John R. Dibb, published in 1938. It is primarily Dibb's work that I used to identify the species in my collection. The paper presents detailed keys, followed by additional notes on each species. The Atlas of Living Australia currently lists 32 of the 33 species described by Dibb, but with a few differences relevant to my species. Notably, Dibb's three sub-families have been collapsed to two – Aulacocyclinae and Passalinae. Also, the species which Dibb refers to as Pharochilus politus has been corrected to its original name, Pharochilus rugiceps, based on precedence. As the details below use Dibb's keys, I will use his naming system, but showing the corrected names in parentheses. 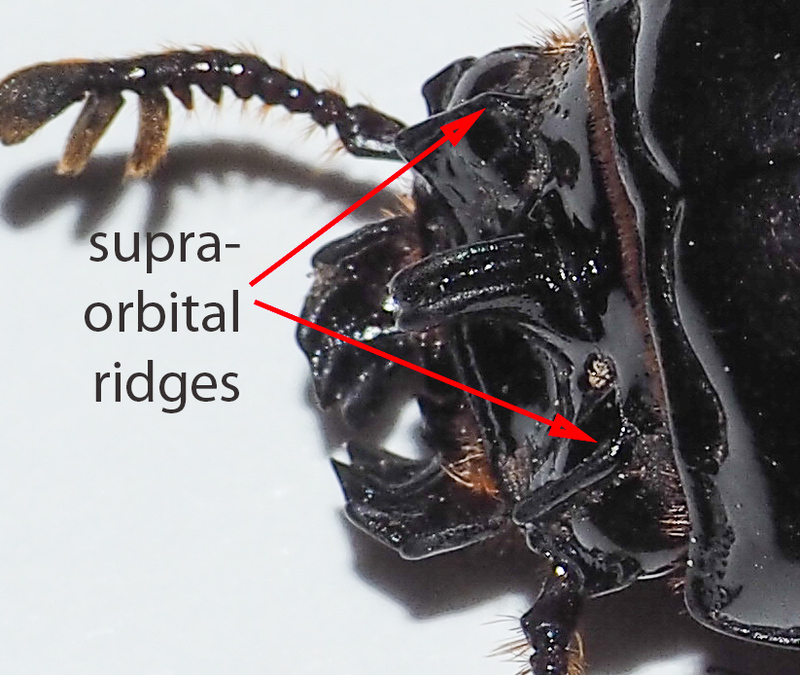 The head, with its bumps ('tubercles') and ridges ('carinae'), is central to identification of Passalid Beetles. In addition, Dibb (1938) makes extensive reference to the 'mentum', one of the insect mouthparts (part of the labium). It is only visible from the ventral side. Before I could begin making sense of the keys or species descriptions, I had to come to terms with the terms! A few weeks ago Paul discovered a large group of Passalid beetles when he rolled aside a decomposing eucalypt log, exposing the region beneath the bark. The log had lain there for seven years, half-covered by a large pile of composting bark and leaves. Consequently, it is quite a damp environment, rich with fungi and other invertebrates. There were at least ten adult beetles and numerous larvae. We collected two of the adults. The simplest step of all. I can exclude Aulacocyclinae as my species DOES have inner and outer tubercles (Fig. 5). Also, the prosternum IS visible between the bases of the anterior coxae (Fig. 6). I can exclude Leptauliacinae as the antennae have more than 3 lamellae (Fig. 7). Dibb (1938) lists eight genera in the subfamily Macrolininae. I can exclude Notocetius based on the shape of the central tubercle. It is NOT dorsally flattened, and nor does it have a bifid (branched, or 2-lobed) apex (see Fig. 5). Distinguishing between the remaining seven genera relies quite heavily on the features of the mentum. The mentum is NOT uniformly glossy, which excludes Mastochilus, Analaches and Cetejus. It is somewhat glossy in the central region, but quite matt laterally (Fig. 8). And the mentum DOES have scars (Fig. 8), which excludes Gonatus, Labienus, and Protomocoelus. As the scars are not very obvious structures, it is reassuring to have additional evidence upon which to exclude these three genera. In Gonatus, Labienus, and Protomocoelus, the lateral and intermediate areas of the metasternum blend together. In Species 1, they are quite clearly distinct regions (Fig. 9). At this point, I could jump right in and state that because the inner tubercles are NOT widely separated, the species is Pharochilus punctiger. But what is 'wide' anyway? Relative terms are difficult unless you have other species on hand for comparison. So I like to double-check by excluding the other five species, using other characters. I can exclude P. dilatatus, as the impressions of the lateral elytra striae are NOT transverse (Fig. 11) . Also, the frontal area (the zone bounded by the central and inner tubercles) is triangular in shape, NOT transverse (Fig. 10). I can exclude P. scutellonotus and P. nitidulus as the lateral lobes of mentum do NOT have a narrow, matt border (rather, they are nearly entirely matt) (see Figs. 8 & 12). I can exclude P. politus (P. rugiceps) as the central plate of the mentum IS dimpled ('punctate') (Figs. 8 & 12). And I can exclude P. puncticollis because the central plate of the mentum is dimpled throughout, NOT just near its anterior margin (Fig. 12). Happily, after all that, the other aspects of Dibb's description of the species 'fit'. 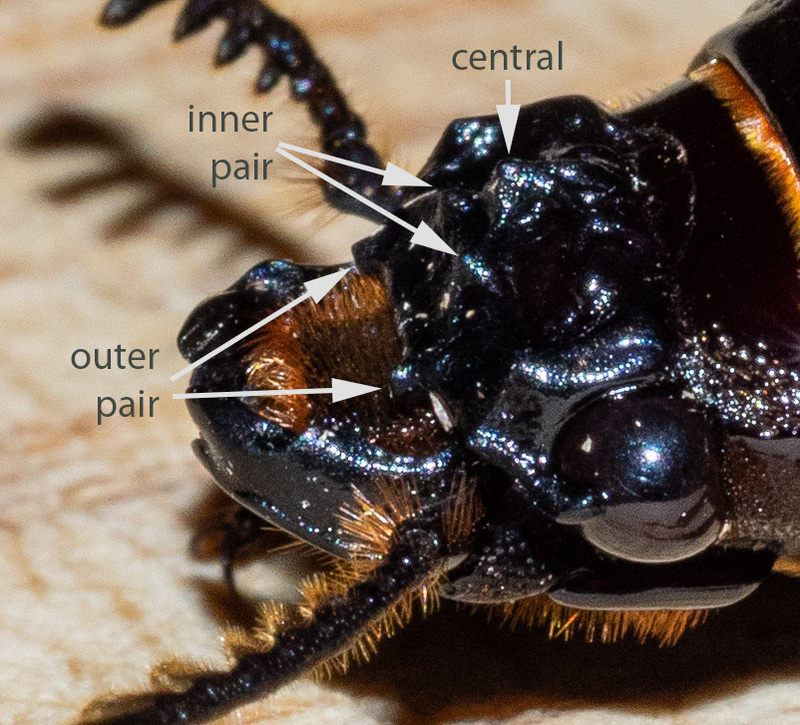 He reported P. punctiger from New South Wlaes and, importantly, he states that the dorsal view of the head is “unlike any others of the genus” in the “absence of the frontal carinae between the inner and outer tubercles and the carina uniting the inner tubercles” (Fig. 13). Proof positive, I reckon! There is, however, one difference between the insects I examined and Dibb's description. He gives the length as 31mm, but the two I collected are 32mm and 34mm. I believe this simply reflects normal size variation (common in beetles, including Passalidae), and that this range was simply not evident in the material that Dibb had available to him. We keep records - and photos - of the various invertebrates we encounter here in the forest. No surprise, I know! Well, filed under 'Passalidae' we have a record from January 2015. The beetles were found under a piece of wood that we'd placed as a bollard, marking off our car parking area. The soil is sandy and well-drained. The beetles were discovered on the soil surface when we tipped the wood round aside. And, having become so familiar with Dibb's keys this week, when I looked back at the photos I immediately knew we had a different beetle! Three and a half years on, and the beetles are still there, in the exact same environment! Here is a photo taken yesterday (Fig. 15). Red or black? Colour is not a discriminating feature. The four adults I saw yesterday included both red and black individuals. I've also read that younger beetles are typically red, darkening as they age. Figure 15: found in August 2018 ... in virtually the same place as the beetle in Figure 14! If you followed my detailed defence of Species 1 identification, you'll immediatiely spot some differences. Again, I'll step through my logic, based on Dibb's keys (1938). Species 2 meets the criteria for the subfamily Aulacocyclinae. 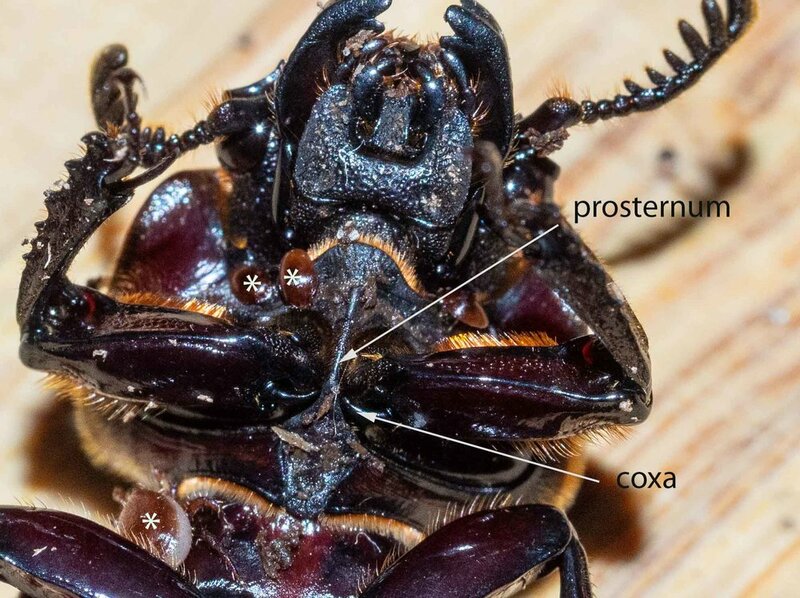 First, the anterior coxae ARE extended, obscuring the intercostal surface of the prosternum (Fig. 16). Second, and more convincing to my mind, is the absence of several distinctive head bumps and ridges. Most notably, there are NO inner or outer tubercles (Figs. 17 & 18). Australia has just a single genus belonging to this subfamily. Too easy! Here things get interesting again. Dibb (1938) recognised 11 Aulacocyclus species, and since then two more species have been added. The first step in Dibb's key distinguishes A. macleayi from all other species based on "supra-orbital carinae united posteriorly across vertex". I don't see any such ridge in Species 2 (Fig. 19). I exclude A. macleayi, but with some reservation. The other features Dibb ascribes to A. macleayi are a good fit for my beetle ... size, leg shape, distribution ("Sydney"). On balance, however, I'm excluding A. macleayi. I would love to have a specimen for comparison ... so perhaps a visit to the Australian National Insect Collection is in order! Several other species can be excluded on the basis of the central tubercle shape. - and A. rosenbergi, as it most certainly DOES have a dorsal groove (Fig. 19). Seven down, four to go! I can exclude A. teres on a number of features, including the punctures on the anterior lip of the pronotum ... A. teres does not have these (Fig. 21). Finally, I can exclude both A. collaris and A. allicornis, as the antennal lamellae are LESS THAN five times as long as they are wide (see Fig. 19). Other aspects of Dibb's (1938) description of A. edentulus also fit with Species 2. He gave the size range as 23-30mm ... the beetle I collected this week was 28mm ... and the known distribution as Queensland, Victoria, and New South Wales. He also states that the central tubercle is "strongly elevated and, more or less, arcuate, seen from above with bifid apex" (p. 109) (see Fig.20). What about the two 'new' species, not discovered in Dibb's day? I exclude A. tambourinensis, as it has elytra that are rough, not shiny and smooth (Reyes-Castillo & Jiménez-Ferbans, 2016). The same authors declared no difference between A. hangayi and A. collaris ... and I've already excluded the latter. Species 2 fits their description of A. edentulus, including that the central tubercle reaches the front of the head (Reyes-Castillo & Jiménez-Ferbans, 2016). But wait, there's more! There is another Passalidae sighting among our records. In July 2017 we uncovered a colony living under the bark of a rotting log, again in our firewood pile. A glance at the photos and I think "not Aulacocyclus" ... too many head bumps and ridges! A closer look rules out Pharochilus punctiger too. The ridges are different. It must be a third species!! I admit to being both surprised and excited. It certainly does have inner and outer tubercles, so I can exclude Alacocyclinae. And as the inner tubercles are NOT on the anterior margin on the head, I can also exclude Leptauliacinae. Dibbs lists eight genera. I can immediately exclude Notocetius, as it lacks ridges in the frontal area of the head. Species 3 definitely has frontal ridges (Fig. 24). The lateral and intermediate regions of the metasternum are distinct (Fig. 25), so I can also exclude Gonatus, Lanienus and Protococoelus. The mentum is not uniformly glossy (Fig. 26), so that excludes another three genera: Mastochilus, Analaches, and Cetejus. So, definitely the same genus as Species 1, but clearly a different species. I can exclude P. punctiger for several reasons: the inner tubercles are widely separated; there is a ridge between the inner and outer tubercles; and there is a ridge between the two inner tubercles (see Fig. 24). The frontal view of the head (Fig. 24) also excludes P. puncticollis, as the frontal area is not crescent shaped. 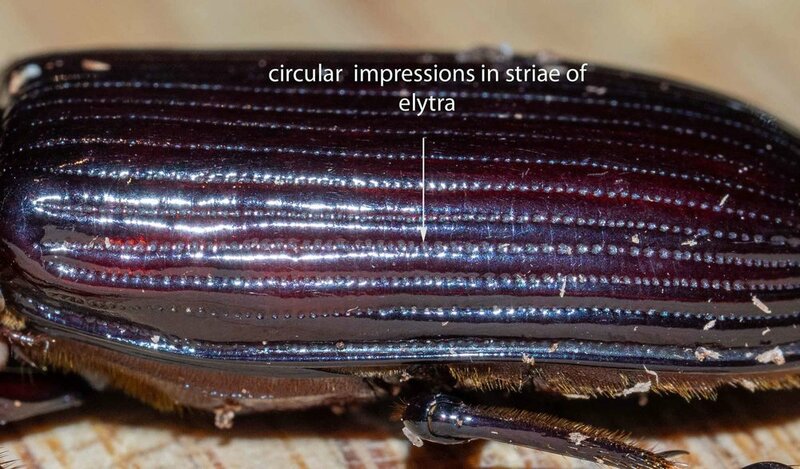 The pattern of punctures on the elytra exclude P. dilatatus. In Species 3 they are NOT strongly transverse (Fig. 27). I can also exclude P. scutellonotus, as the scutellum is not punctate. It is obviously smooth (Fig. 28). 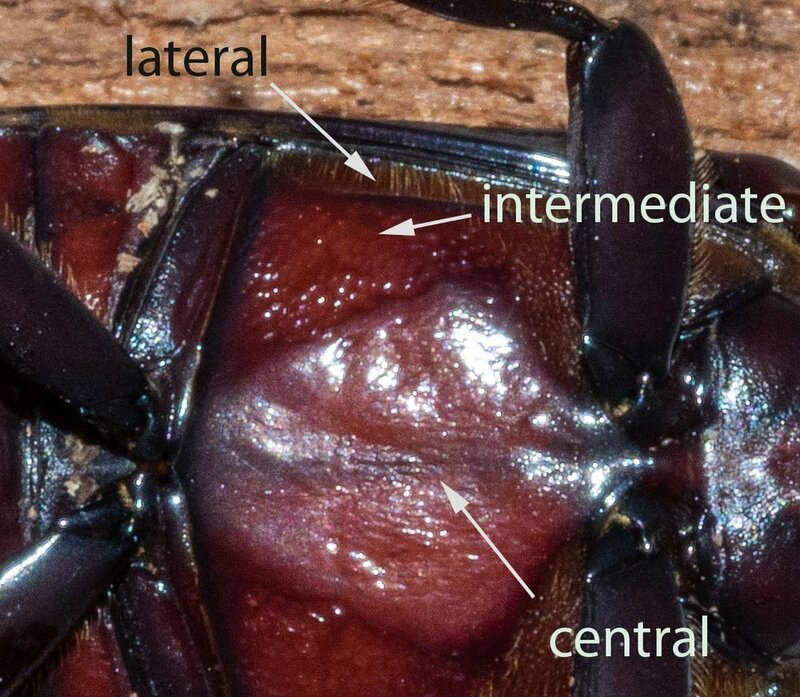 Figure 28: dorsal view of junction between pronoun (right) and elytra (left), showing the triangular scutellum. Anterior is to the right. This leaves two possibilities: P. nitidulus and P. politus (rugiceps). Dibb's key distinguishes the two on the basis of the relative width of the lateral region of the metasternum. In Species 3, it seems 'broad' rather then 'narrow' (see Fig. 25). In addition, Dibb (1938) describes this as the most widespread and abundant species in the genus, and had specimens from Victoria, Tasmania, New South Wales and Queensland.